MTV Unplugged is a TV series showcasing many popular musical artists usually playing acoustic instruments. The songs featured on the show are mostly officially released earlier by the artists. Songs of this episode is sung by Ayushmann Khurrana, Papon, Siddharth Mahadevan, Ami Mishra. 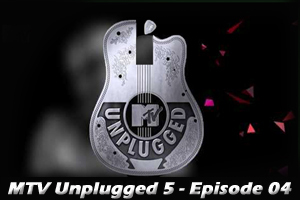 Here is the link of all the songs lyrics and videos of MTV Unplugged 5 - Episode 04.